Join the conversation about Panasonic Bluetooth Classic Modules. Topics include application questions, features, specs and more. Looking to design in one of our Bluetooth SMART Ready modules? Browse the open topics about features, application questions and more. Does the PAN1026 support iPhone connectivity? PAN1026A - SPP "Service name" change. Let our product engineers help you with any questions you may have about our Bluetooth SMART modules! Is it possible to forward read request to application in from PAN 1026 SDK. Do i need to register separate callbacks for each service / characteristic ? Have a question about our Embedded Wi-Fi Modules? Share your question with the community today! How can one restore the demo configuration once index.html has been updated? Have a question about our Multi-Mode Modules? Share your question with the community today! Which NXP i.MX6 Device is on the PAN9026-IMX? Our technical specialists are working around the clock to answer your questions about our Wi-Fi Only modules. If you have any inquiries about our 802.15.4 Mesh, simply ask a question and start a new discussion! Have any specific question about our Bluetooth Mesh Network? Ask here and our product experts are happy to help! Panasonic is constantly looking to improve and revolutionize wireless communication. With so many new wireless products, we’re sure there’s so much you want to know! Stay up to date with all of our New Product Introductions. Want to know more about a specific product series? 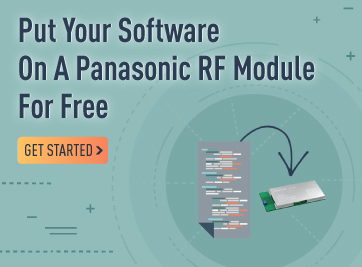 Download the evaluation kit for any of our Bluetooth Modules here!